I have been approached by certain Brethren and subscribers for answers to questions they should understand as essential elements of the faith. We must each be familiar with Brother Branham's "Revelation of the Seven Seals," "An Exposition of the Seven Church Ages," "Conduct, Order and Doctrine of the Church" and His post-Seals sermons (1963-1965), proving all things in our own Bible. These are all available in hard copy, on CD, or online from Voice of God Recordings, PO Box 950, Jeffersonville, Indiana 47131, USA, from their offices, and from Churches throughout the world. I try my best to assist you who are nearby and you who are far away. If at all possible you should each be attending and supporting a Church that is strong in the revelation of this Message. "Iron sharpens iron," and fellowship with like-minded people or anyone who loves the Lord will enable you to exercise your Gift and be blessed, and be a blessing to that one in a million professed believers who is elect. Don't be satisfied with a second-hand religion, "Study to show yourself approved of God, rightly dividing the Word of Truth". Please welcome our new guest contributor whose writings have been linked in the current affairs section of past issues. Paul Craig Roberts should be familiar to you as Assistant Secretary of the Treasury in the Reagan administration. He was Associate Editor of the Wall Street Journal editorial page, and Contributing Editor of National Review. He is coauthor of The Tyranny of Good Intentions, and his article in this issue emphasises the extreme lateness of the hour. Trim and fill your lamp with oil without delay, while the door of Mercy is open. Recognize your shortcomings and keep your weaknesses covered. Redeem the time, study while you have liberty, because the whole world is about to be turned into chaos such that men's hearts will fail in dread of trials that will soon come upon your town, your street, you place of work, shopping, school, and church—whoever and wherever you are. Take a firm grip on Christ the revealed Word now, because when the Gentile dispensation ends it will be you and the Lord alone, not you and money, you and your spouse and family. Each of the News items this week seems to highlight a scam of some kind—all with a common denominator. Lucifer and the children of Darkness are turning off the Lights around the world as Death rides "to kill with war, famine, disease, and wild beasts of the earth". Moscow, March 27, 2008  "The latest military intelligence data point to heightened US military preparations for both an air and ground operation against Iran," the official said, adding that the Pentagon has probably not yet made a final decision as to when an attack will be launched. He said the Pentagon is looking for a way to deliver a strike against Iran "that would enable the Americans to bring the country to its knees at minimal cost". . . Full story: informationclearinghouse.info; Israel is laying foundation for Iran War and Saudi Arabia is reportedly preparing to counter any 'radioactive hazards' which may result from a US strike on Iran's nuclear plants. February 28, 2008  Israel's Declaration of Independence states that the Jewish people arose in the Land of Israel and was exiled from its homeland. Every Israeli schoolchild is taught that this happened during the period of Roman rule, in 70 CE. The nation remained loyal to its land, to which it began to return after two millennia of exile. Wrong, says the historian Shlomo Zand, in one of the most fascinating and challenging books published here in a long time. There never was a Jewish people, only a Jewish religion, and the exile also never happened—hence there was no return . . . According to Zand, the Romans did not generally exile whole nations and most of the Jews were permitted to remain in the country. The number of those exiled was at most tens of thousands. When the country was conquered by the Arabs, many of the Jews converted to Islam and were assimilated among the conquerors . . . 30 years before the Declaration of Independence; [this thesis] was espoused by David Ben-Gurion, Yitzhak Ben-Zvi and others. Comment: This "invention" agrees with your Bible and is the conclusion other historians, including "Jewish" historians, and also with the ADL . . . until it became expedient for them to create a race. In nearly 100 years of existence, the Fed has NEVER been audited and they don't pay income tax on the billions of dollars they take . . . According to Congressional Record the US Government can buy back the FED at any time for $450 million. That's about half the amount of money we pay them daily. The American taxpayers paid the FED banking system $173,875,979,369.66 in interest in just five short months, from October, 2005, through February, 2006. No con artist or group of con artists in history has ever perpetrated a scam that even approaches the scope of this one . . . Full story: wtv-zone.com Fox in the Hen house. March 27, 2008  Several new studies show the bio-fuel boom is doing exactly the opposite of what its proponents intended: it's dramatically accelerating global warming, imperilling the planet in the name of saving it. Corn ethanol, always environmentally suspect, turns out to be environmentally disastrous. Even cellulosic ethanol made from switch grass, which has been promoted by eco-activists and eco-investors as well as by President Bush as the fuel of the future, looks less green than oil-derived gasoline. Comment: This constitutes part of the plan of global impoverishment, sickness, famine, depopulation, and for the surviving minority, serfdom (Revelation 6:8). Download Christopher Monckton's references, charts, graphs and detailed calculations that expose this scam. Full story: telegraph.co.uk Diagrams showing Earth's axis tilt has recently increased by an additional 26o according to NASA, USGS, NOAA, NWS, SOHO. The Establishment is in on this deceitful scam of Lucifer's NWO children of Darkness to strike fear into men's hearts so they can take control. As usual their hucksters are out to defraud, this time with a CO2 carbon trading Ponzi scheme. November 30 1941  Six days BEFORE Roosevelt's "surprise" attack, headlines in the Honolulu Advertiser read "Japanese may strike over Weekend!" The story outlines how the US government was aware of the oncoming attack. After the attack, of course the government said that it was a "total surprise," and a massive coverup of the conspiracy began in earnest. The government managed to destroy almost all the evidence, even going into the Hawaii hospitals and ripping off the front page of this paper. However, Private Paul Brown, saw what was going on and managed to rip off his own front page of the Advertiser and hide it from the government. This is one of very few known copies of that paper. It is hanging in the Punta Gorda Florida Military History Museum. March 19, 2008  Unknown to most new parents, or those who became parents in the last ten or so years, DNA of newborns has been harvested, tested, stored and experimented with by all 50 states. And all 50 states are now routinely providing these results to the Homeland Security Department. No doubt we can all see the benefits in testing for genetic disorders or genetic traits and tendencies that could be more adequately dealt with, in some cases actually deterring the onset of life-time illness, but that seems not to be the real thrust of these programs . . . Here in Minnesota the state tests for 56 various genetic disorders and variants. At least 1/3 of these tests produce a false positive meaning that a flaw was identified that actually did not exist . . .
March 30, 2008  Brain expert warns of huge rise in tumours and calls on industry to take immediate steps to reduce radiation. Mobile phones could kill far more people than smoking or asbestos, a study by an award-winning cancer expert has concluded. He says people should avoid using them wherever possible and that governments and the mobile phone industry must take "immediate steps" to reduce exposure to their radiation. The study, by Dr Vini Khurana, is the most devastating indictment yet published of the health risks. It draws on growing evidence—exclusively reported in the IoS in October—that using handsets for 10 years or more can double the risk of brain cancer. Cancers take at least a decade to develop, invalidating official safety assurances based on earlier studies which included few, if any, people who had used the phones for that long. April 4, 2008  A deadly fungus, known as Ug99, which kills wheat, has likely spread to Pakistan from Africa, according to reports in the British New Scientist. If true, that threatens the vital Asian bread basket, including the Punjab region. The spread of the deadly virus, stem rust, against which an effective fungicide does not exist, comes as world grain stocks reach the lowest in four decades and government subsidized bio-ethanol production, especially in the United States, Brazil and the European Union, are taking land out of food production at alarming rates. The assault on the US Constitution by the Democratic Party is as determined as the assault by the Republicans. On October 23, 2007, the House passed a bill sponsored by California Democratic congresswoman Jane Harman, chairwoman of a Homeland Security subcommittee that overturns the constitutionally guaranteed rights to free expression, association, and assembly. Harman's bill is called the "Violent Radicalization and Homegrown Terrorism Prevention Act. "When HR 1955 becomes law, it will create a commission tasked with identifying extremist people, groups, and ideas. The commission will hold hearings around the country, taking testimony and compiling a list of dangerous people and beliefs. The bill will, in short, create massive terrorism in the United States. But the perpetrators of terrorism will not be Muslim terrorists; they will be government agents and fellow citizens. Who will be on the "extremist beliefs" list? The answer is: civil libertarians, critics of Israel, 9/11 skeptics, critics of the administration's wars and foreign policies, critics of the administration's use of kidnapping, rendition, torture and violation of the Geneva Conventions, and critics of the administration's spying on Americans. Anyone in the way of a powerful interest group—such as environmentalists opposing politically connected developers—is also a candidate for the list. This bill is a boon for nasty people. That SOB who stole your girlfriend, that hussy who stole your boyfriend, the gun owner next door—just report them to Homeland Security as holders of extreme beliefs. Homeland Security needs suspects, so they are not going to check. Under the new regime, accusation is evidence. Moreover, "our" elected representatives will never admit that they voted for a bill and created an "Extremist Belief Commission" for which there is neither need nor constitutional basis. Think about it. More than six years ago the World Trade Center and Pentagon were attacked. The US government blamed it on al Qaeda. The 9/11 Commission Report has been subjected to criticism by a large number of qualified people—including the commission's chairman and co-chairman. Since 9/11 there have been no terrorist attacks in the US. The FBI has tried to orchestrate a few, but the "terrorist plots" never got beyond talk organized and led by FBI agents. There are no visible extremist groups other than the neoconservatives that control the government in Washington. But somehow the House of Representatives overwhelmingly see a need to create a commission to take testimony and search out extremist views (outside of Washington, of course). This search for extremist views comes after President Bush and the Justice (sic) Department declared that the President can ignore habeas corpus, ignore the Geneva Conventions, seize people without evidence, hold them indefinitely without presenting charges, torture them until they confess to some made up crime, and take over the government by declaring an emergency. Of course, none of these "patriotic" views are extremist. Comment: In 1963 the Prophet warned of an "Extremist Beliefs Commission": "This Jezebel system, now blind spiritually (I'm saying) to the Word of God, joining themselves right into the Council of Churches . . . Everything, our great evangelical teaching, we have to forfeit that to be an organization. 'Cause all organizations that isn't in this Council of Churches . . . I got the paper on it, that even if your church is not in this Council of Churches, in time of trouble, they can use your church to store ammunition or anything they want to. And if any man is caught having a prayer for anybody, outside of affiliating with this Council of Churches, can be shot, as a federal offense. That's right. I got the papers on it from Washington. See, see? You . . . They're going to force you into it. That's why I've been against this organizational system. That's it. I had to keep it quiet about it being the mark of the beast, but it's late enough now till you can know it's the truth. Uh-huh. See? It is. It's exactly that" (Just Once More Lord, p. 10:52). He taught that Rome and the non-Semitic anti-Semitic self-styled Jews will reach an agreement to refinance the US dollar with gold backing in the time of the second crucifixion in which Jerusalem, "which spiritually is called Sodom and Egypt, where also our Lord was crucified," plays a crucial part as the headquarters of Lucifer's totalitarian one world government. The Bible is emphatic, the tribulation will be "the time of Jacob's trouble," not the time of Esau's trouble, for "Esau has the dominion" (Jeremiah 30:7; Genesis 27:40). And until Rome breaks their agreement, the Jews will have great influence over her. The "extremist beliefs" list will include individuals and groups likely to oppose the ambitions of the Banksters behind the beast of Papal Rome (Revelation 13:1-10), her (once) Protestant image, and the United States, which is the image of Imperial Rome (Revelation 13:11-18; Five Things You Need to Know to Understand the Latest Violence in Iraq). Dozens of organizations known as fusion centers were created after September 11, 2001 to identify potential threats and improve the way information is shared. The centers use law enforcement analysts and sophisticated computer systems to compile, or fuse, disparate tips and clues and pass along the refined information to other agencies. They are expected to play important roles in national information-sharing networks that link local, state and federal authorities and enable them to automatically sift their storehouses of records for patterns and clues. "Big Brother" has his eyes on you . . . and the walls have ears. Now is the time we should check-up, and "give diligence to make our calling and election sure" (II Peter 1:10). Peter said "grace and peace are multiplied through the knowledge of God and of Jesus our Lord." And we are to "build upon or add to the foundation of faith, (our clear understanding of God's revealed Word), virtue, (which is spiritual strength), and to virtue, add knowledge; to knowledge, add temperance; to temperance, patience; and to patience, godliness; to godliness, add brotherly kindness, and to brotherly kindness, charity"—"without which," Paul taught, "we are nothing," because God is love, and the love of God is Christ the Capstone and Head of the Temple of God, which is His mystic Body, and the Capstone revelation encompasses all of these virtues. Peter taught, "He that lacks these things is blind and cannot see afar off." In other words, he is not born-again and not a genuine Christian. Oh, He may pay his tithes. He may be a minister, sing in the choir and never miss church. But if he can't "see afar off" he lacks the evidence of the baptism with the Holy Ghost or new-birth. Jesus said, "the Holy Spirit will, (not might), guide into all truth, and show you things to come;" enabling all Christians to "see afar off". Grace and peace are multiplied to us through this knowledge. Knowing the things that will come to pass in our day casts out fear caused by uncertainty, and imparts the peace of God not understood by the natural man. So the evidence of being a genuine Spirit-filled Christian is a clear understanding of the revealed Word for your day—a perfect comprehension of what Jesus is doing now, and what He will accomplish in the near future. In other words, you will "see afar off." And what you see will be THUS SAITH THE LORD, because you have the mind of Christ in you. If you give diligence to add all of these virtues, "not being a forgetful hearer, but a doer" as James admonished, then you will be established in the "present truth." God is only writing epistles of the present Truth: the Word predestinated to the Church Ages has already been fulfilled by the sleeping saints. According to I John 1:7, "Unless our lives are manifesting the Light God is revealing now, we are not and cannot come under the blood, (or be born-again), or even share Christian fellowship." Unless we recognize our day and manifest its Message, we are not Christians. Not even called to at all. 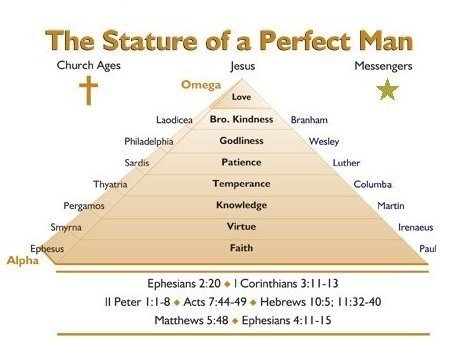 This diagram portrays how God's Temple (Revelation 21:22) has been built according to II Peter 1:1-12 and Revelation 23 as He revealed His Word "precept upon precept, line upon line, here a little and there a little." Christ's Body of all Ages is New Jerusalem. The base line signifies the foundation of unchanging faith "once delivered to the saints" as Jesus taught His disciples in Matthew 16:13-19. The breach between the PART-Word Body and Christ the Headstone and fullness of the Word, shows the Church Ages end in apostasy by rejecting His second or 'parousia' Coming as Israel rejected His 'erchomai' Coming (Romans 11:25; II Timothy 4:2-4; Revelation 3:17-20). This breach of Revelation 4 also shows the "squeeze" when the door of grace is shut and Christ's end-time Bride is rejected by the world church system and by carnal believers in the circle of this Message. The Capstone revelation is incarnating His end-time Bride in this present holy convocation to empower us to manifest the Sons of God during the resurrection of the sleeping saints prior to our translation. From the inauguration of the Church to its translation, the Body or Temple of God has been built by nine distinct baptisms with the Holy Ghost. The dispensation of the apostolic saints represented by the double line or foundation is the antitype of the last six days of the feast of Unleavened Bread (Leviticus 23:6-8). As you are aware, leaven represents sin, which is unbelief in the revealed Word of God; and bread is the staff of natural life. Jesus said, "I am the bread of eternal Life that came down out of heaven. Whoever eats of this bread will live forever" (John 6:50-53). For the apostolic saints, this staff of Supernatural Life was the faith delivered pure and undefiled by man-made creed and traditions. The "lively stones" built upon this foundation during the Seven Church Ages were created by the PART-Word Messages of the seven "angels" that formed this pyramid constellation the prophet saw in a vision, which he described to his Church on December 30, 1962 (Sirs, is This The Time?). The vision was fulfilled on March 8, 1963, when he was hunting Javelina pigs upon Sunset Mountain as explained in Newsletter 245. In The Revelation of the Seven Seals Brother Branham makes clear it was revelation of the individual "Voices of the seven thunders" that spoke the "lively stones" of the PART-Word saints into the body of the pyramid as the collective "Voices of the seven thunders" are now placing Christ's end-time Bride into the Capstone. As you are aware, the loud clapping noise of a thunder is the Voice of God (John 12:23-29). And as Brother Branham explained, the messengers to the Church Ages did not live long enough to restore Church order and doctrine, and as no fresh manna fell in the seventh Age its messenger was to gather up the "loose ends" of revelation left unfinished by the angels to the previous six Ages. "Now this messenger of Malachi 4 and Revelation 10:7 is going to do two things. One: According to Malachi 4 he will turn the hearts of the children to the fathers. Two: He will reveal the mysteries of the seven thunders in Revelation 10 which are the revelations contained in the Seven Seals. It will be these divinely revealed 'mystery-truths' that literally turn the hearts of the children to the Pentecostal fathers. Exactly so" (An Exposition of the Seven Church Ages, p. 327:1). This was Brother Branham's commission: it was fulfilled by the revelation of the unwritten Seventh Seal, which is the spoken Word of His Message expounding the mystery of the previous six written Seals. After the close of the Laodicean Church Age the revelation of the Seven Thunders brought Christ back to earth in WORD form (March 17-24, 1963; Acts 3:19-23; I Corinthians 13:10; Revelation 10:1-7). This was His second or 'parousia' Coming to incarnate His end-time Bride. It began the holy convocation or the fiftieth day of the antitype of the Pentecostal feast in which "there is silence in heaven about the space of half an hour" while His wife dresses herself in "fine linen, which is the righteousnesses of saints" (Revelation 8:1; 19:7-9). As he prophesied in his pre-Seals Message, Sirs, is this the Sign of the End-Time and Christ's Parousia" (Matthew 24:3), we live in the holy convocation in which the apostolic faith has been restored and the mystery of God is finished. Our messenger is not William Branham, but the One he introduced—Christ—the Capstone revelation of the fullness of the Word. This is the mystery of the Voices of the Seven Thunders. Those who have not received this revelation are souls imprisoned now in apostate Laodicea, separated from Christ and His end-time Bride by the breach of Revelation 4. The diagram illustrates how each of the nine dispensations was distinguished by the Token or evidence of its own peculiar virtue of the Life of Christ, whilst the evidence of the new birth of the Capstone Bride is the Token of the fullness of the Life of Christ on display in her life by a clear revelation of the fullness of the Word. Every genuine Christian will have the evidence of the baptism with the Holy Ghost. This means the Holy Spirit will guide him into the understanding revealed for his day, and reveal things that will come to pass in his day. So his life will be a written epistle of the present truth—what Jesus is doing now. If you will open your Bible at I Timothy 2:5 we will study the subject of Christ's Mediation. A listener to our radio program said to me, "there is one Mediator between God and men, the Man Jesus Christ, and He is a Mediator forever and ever". I said to the Sister, this is not Bible teaching. In I Timothy 2:5 we read, "There is one God, (not two or three of them), and one Mediator between God and men, the Man Christ Jesus." Period! It says nothing about Christ being a Mediator forever and ever. So I said to her, Jesus Christ is not a Mediator now. He has not been a Mediator since 1963 when the Seven Church Ages ended and the Seven Seals were revealed. If we are Christians we will live by faith, or a clear understanding of the present Truth. We will know what Jesus is doing now, because He can only do it through His Body, through Christians. Regardless how dearly we love Jesus Christ and read God's Word, without faith it is impossible to be a Christian. If we think Jesus is a Mediator today, and He's not a Mediator, it shows we don't know Jesus Christ. We may love Him with all of our heart, but we have never received His love (II Thessalonians 2:10). Unless we know what Jesus is doing now our love is not mutual, and we are not Christians. We may have psychology but we have no relationship with Him. Now is the time when we should check-up and "give diligence to make our calling and election sure" (II Peter 1:10). The Church or Body of Christ is led by the Spirit of God which is its Head, the Word. If we are the Body of Christ we will be in the common faith or understanding, and know what Jesus is doing now. If we don't know what Jesus is doing now we have no communion, do not know Him, are not baptized into His Body, and not born-again Christians. "A double minded man is unstable in all his ways" (James 1:8). We've got to have the mind of Christ in us, and His mind is not confused, it's infallible, knows precisely what His Word means and what He is doing now. So "examine yourselves, whether you're in the faith; prove your own self while grace is still available. Knowing that Jesus Christ is in you, unless you are reprobate" (II Corinthians 13:5)! Check-up on yourself. If you find your faith short of God's requirement, be prepared to receive correction by His understanding. We're going to study five questions. What is a Mediator? Why was Jesus a Mediator? When did Jesus become a Mediator? For whom did Jesus Mediate? When was His mediation fulfilled? What is a mediator? A Mediator is a "go-between." A Mediator is one who stands between two parties in disagreement. If two parties to a contract have a dispute, a third party will stand between them, and without taking sides, bring them into harmony according to the terms of that agreement. A mediator must understand the frailties and necessities of both parties but his loyalty must lie with the terms of the covenant. The Bible says "our High Priest understands our weaknesses, as He had the same temptations as we do, yet without sin" (Hebrews 4:15). He was loyal to the terms of the Covenant which is the Word, and He is that Word manifest in flesh who ratified the contract in His Own blood. 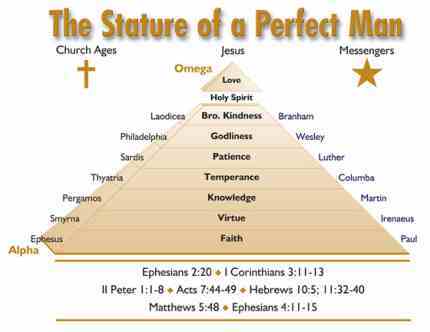 He qualifies as the one and only Mediator between God and men as He is both God and Man. Therefore He is an impartial Mediator. He is the beginning of the [new] creation of God, the start of God, creating Himself a part of the material world, around 2,000 years ago (Revelation 3:14). Jesus was a "go-between" for God and His elect, because they were not in agreement. In other words, these Christians were in error on God's Word. Of course God is the Word, and Jesus was that Word manifest in virgin-born flesh. Clearly therefore, He interceded in our behalf. The Church Age saints were in error but they were only required to manifest the Word for their age. As Mediator, Jesus received the Word for their day and placed their errors of ignorance under the blood so they could be born-again. Why was Jesus a Mediator? Why did God's elect require a Mediator? Put another way, why were all of the Church Age saints in error? They were in error and required intercession because as Daniel 12:4, 9 and Jesus (Revelation 10:4) explain, the Bible was sealed with Seven Seals "until the time of the end," when Christ having completed His Mediation, claimed the Book in response to the call of the elders, opened the Seals, and revealed their hidden mystery to the angel or prophet-messenger to the Laodicean Church Age, who expounded this revelation in our day. Christ was a Mediator so long as the Book was sealed. That is, from Pentecost to the close of the Laodicean Church Age, Christ was a Mediator between God and His elect who were in disagreement in the faith because so long as the Bible was sealed they had only PART-Word. Thus until Christ claimed the Book, opened the Seven Seals and revealed their mystery to His elect they were all believing and preaching a measure of error. In I Corinthians 13:10, Paul called it PART-Word, which men mixed with human reasoning, or guesswork! That's why Christ was a Mediator, and why the Church was in error. The saints were mainly Israelite converts until the Thyatira Age (AD606). In Pentecost, "Jewish fables" were introduced (Galatians 4; Titus 1:14). Then the Ephesian Age fell from their "first love," the Word, by tolerating the "deeds of the Nicolaitanes" which established a hierarchy within the ministry that stood between God and men, usurping the Headship of the Spirit. These "deeds" were enshrined as "doctrine" in the Pergamean Age when the Roman Universal church organized at the First Nicaea Council. It began killing Christians and all who refused her Trinity of gods and baptism in three Titles, and the faith which was in the hearts of the saints was lost when they were martyred by the false church; this brought the Dark Ages upon the Western world. The last three Church Ages, or Ages of PART-Word, witnessed the Reformation of the Catholic system of worship. The Reformers not being prophets, sought only to restore the church to what it was when it denominated at the First Nicaea Council of AD325, not realizing that this was where it fell. They didn't realize Jesus ordained and recognizes only one Church. The Church He established on the day of Pentecost. Nevertheless, the last three Church Ages restored the revelations of justification by faith (not works), sanctification (or Scriptural holiness), and the baptism with the Holy Ghost. In Pentecost and each of the Seven Church Ages, Christ received the faith of His elect in the portion of WORD (PART-Word) predestinated to their Age as revealed by the Message of the angel or messenger to that Age, and interceded for their lack of the fullness, placing their ignorance under the blood. The evidence of their new birth was written in their lives which became epistles known and read of all men by manifesting the Word for their day. The next question is, "When did Jesus become a Mediator?" Good question! He certainly wasn't a Mediator during His earthly walk, for "without shedding of blood there is no remission of sins" (Hebrews 9:22). Prior to Calvary He was the prophet. He was not our High Priest or our King, and only potentially our Saviour. As Son of Man He was the God-prophet who came to His Own and voluntarily surrendered His life in order to redeem His Bride. On the Day of Pentecost He came back in the Office of Son of God, not Son of Man; throughout the Church Ages He was Son of God, Parakletos, Advocate or Mediator. At the end of the Laodicean Church Age, He veiled Himself behind the flesh of a sinner saved by grace, healed the sick, raised the dead, and discerned the thoughts and intents of the heart to reveal Jesus Christ as Son of Man again, "the same, yesterday, and today, and forever" (Luke 17:28-30; Genesis 18; Hebrews 4:12). Then the revelation of the Seven Seals brought Christ back to earth in WORD Form in the Office of Son of Man (Revelation 10:1-4). All of the Gospels foretell Jesus returning as Son of Man in WORD Form at the close of the Laodicean Church Age, to indict the world and bring His elect into the unity of the faith. Jesus is not a Mediator today. At the start of the Millennium, the glorified Jesus will physically return to earth with the saints of all Ages, and step upon the ashes of the wicked after Armageddon has destroyed all life. He will not be a Mediator, He will be in the Office of Son of David, and as such He will be King. Christ was a Mediator from the Day of Pentecost when the Church was inaugurated. He was not and could not possibly have been a Mediator until the Day of Pentecost had fully come. The average church-goer thinks Christ was and is still a Mediator for everyone in the world. Regrettably, the average church-goer does not think! Jesus was never a Mediator for everyone. To start with, because of original sin in the Garden of Eden, the majority of earth's population are not in Adam's race, and are therefore without a Saviour and irredeemable. Jesus was the last Adam; He was not the last Cain. Then for whom was Jesus a Mediator? Christ was a Mediator for the elect of Adam's race predestinated to be born-again whilst the Bible was sealed with Seven Seals—that is, from Pentecost to the end of the Laodicean Church Age. He is not a Mediator today. This is a stumbling-stone to the unthinking majority of nominal Christians, who say, "If Jesus isn't a Mediator, how can people be saved?" Christ's Mediation has nothing to do with salvation. It has to do with being born-again. Every individual born into Adam's race is born "saved." In other words, their name is in the Book of Life. The Book of Life is the genealogical record of Adam and all of his descendents from Abel to the last soul born without miscegenation with the people of Cain. In God's foreknowledge the Book of Life was compiled from the foundation of the world, and potentially Jesus died to redeem every one of those names. But God placed each of us on free moral agency with the option of expressing His will or serving our own desires. Only those foreknown as His elect can be redeemed; their names are recorded in a section of the Book of Life called the Lamb's Book of Life, which is the genealogy of the last Adam; those born of the Man. The names of most non-elect will be removed from the Book of Life and they will be lost, however, so long as a name is in that Book that person is "saved," and will be granted into eternal Life when they appeal at White Throne Judgment. Jesus' Old Testament type was Aaron who interceded for the errors or ignorance of the Children of Israel. Aaron was not a mediator for the Egyptians, Moabites, Canaanites or the mixed multitude that came out of Egypt with Israel, or for peoples of the nations through which they travelled. He was mediator only for the chosen people or called-out ones. Aaron did not intercede for wickedness, but for the mistakes of believers in their service to God. Likewise, Christ was not a Mediator for Buddhists, Muslims and Jews, but for the elect of God. He interceded for mistakes they made in their Christian walk. He interceded for their errors of ignorance in the faith. When was His Mediation fulfilled? Christ is not a Mediator forever and ever. Jesus was only a Mediator so long as the Bible was sealed with Seven Seals. His Mediatorial Office was to bring peace and agreement between God and His elect. His prayer in Gethsemane was not for the world, but for the elect God had given Him out of the world. "That they all may be one; as You, Father, are in Me, and I in You, that they also may be one in Us". That word "one"—"that they also may be one in us" means one by agreement "in the unity of the faith," (Ephesians 4:13; Amos 3:3). And if two are in agreement, they are "one" and do not require a mediator as Galatians 3:20 explains. God ordained five different offices in the ministry to edify and bring His elect to maturity in the faith so they would always have an answer for sinners who inquired of the hope within their heart. These five offices of apostle, prophet, evangelist, pastor and teacher will be in the Body or Church "until we all come into the unity of the faith, fulfilling Christ's prayer that we all may be one; as the Father is in Jesus, and He in the Father, that we also may be one in them" (John 17:20-26). Therefore it is wise not to conduct regular house meetings in the absence of a genuine born-again minister or brother who is an elder in the faith. You should not run such meetings without an elder to keep the doctrine true to God's unchanging Word, as they are likely to lead into errors that separate brethren from the revealed Word. This leads to confusion and denominationalism. Christ is no longer a Mediator. He was only a Mediator so long as the Bible was sealed with Seven Seals. Daniel and Jesus said it would be sealed to the time of the end, "but in the days of the Voice of the angel or prophet-messenger to the Laodicean Church Age, the mystery of God as spoken by the mouth of all His holy prophets since the world began, should be revealed" (Acts 3:21; Revelation 10:7; I Corinthians 13:10). That angel was the prophet William Branham. His ministry restored the apostolic faith, finished the mystery of God, and is now calling Christ's people out of the world church system, into the unity of the faith, for the manifestation of the Sons of God and the translation. In Revelation chapter five, after the end of the Seven Church Ages, the elders advertised for a Kinsman Redeemer. John wept because no man living, or who had ever lived, was worthy to open the Book or even look thereon. Then the elders announced, "The Lion of the Tribe of Judah has prevailed. He overcame in the garden of Gethsemane, and He is worthy". John looked back to see a Lion, but saw the bleeding, bloody Lamb, coming from the sacrifice altar where for 2,000 years His body lay as a memorial while as High Priest He interceded for the errors of the Church Age saints. As the Lamb He was our propitiation and Mediator. As the Lion He is King of kings and Judge. In Revelation chapter four we saw that the Seven Church Ages and Christ's Mediation were over, and the seven portions of the Spirit that baptized the part-Word saints into the Body, had left the earth. They were back before the throne which was no longer a Mercy seat as there is no more blood. It was now a judgment seat on which an angry God sat enthroned, holding the seven-sealed Book of Life. In Revelation chapter five, Christ took the Book which is the Title deed to all He had redeemed. He tore open the Seven Seals and sat down as Judge. No longer is He in the Office of Son of God and Mediator. Now He is Son of Man and Judge as foretold in John 5:27, and the other Gospels. This explains why the denominationals jump up and down, and speak in tongues, yet receive no new birth. They believe Christ is still Son of God and Mediator, when He is Son of Man and Judge. After the close of the Seven Church Ages, Brother Branham stood in the breach between the Capstone and the sealed Body of the Church Age saints as mediator for the Capstone Bride to deliver to us "the keys of hell and of death," our "key to the kingdom of heaven" or new birth and to the body change. It is the unsealed revelation of Jesus Christ contained in the mystery of the Voices of the Seven Thunders John was told not to write (Revelation 10:4; 22:10). Now although the Capstone, that "stumbling stone and rock of offence to both the houses of Israel" has been put out of "the house of His friends" in this generation (Romans 11:32; Revelation 3:20). Still the "shout" of I Thessalonians 4:16, which is the "midnight cry" of Matthew 25:6 confirmed by the heavenly Voice of Revelation 18:4, has called wise virgin out of Babylon into Christ, uniting the Head with the Body, and the Voice of the Archangel is bringing His end-time Bride to maturity in the unity of the faith to manifest that we are the Sons of God and to instil translation faith. Revelation 4, 5, and 10:1-7 were all fulfilled in 1963 when the last saint foreknown in the Laodicean or Pentecostal Church Age was baptized into the Body and Christ's ministry of Mediation was fulfilled. Christ was only a Mediator so long as the Bible was sealed. He is not a Mediator today. The elect of this day do not require a Mediator. Along with the 144,000 elect Israelites we were fully redeemed in Christ on Calvary because we were predestinated to be reborn after the seven thunders had unveiled the mighty God in plain view. Since that which is perfect has come—Christ, the fullness of the Word—PART-Word and a Mediator have been done away. Please remember that throughout the Book of Revelation, John represents Christ's end-time Bride because God revealed this mystery to Jesus after His ascension, and Jesus revealed it to only one other man—William Branham, the angel to the seventh Church Age (Revelation 1:1; 3:14; 10:7). As Christ's end-time Bride, John was caught up in the Spirit into the Lord's Day which commences with the sounding of the Seventh Trumpet and manifestation of the Sixth Seal at the close of the Gentile dispensation. In these visions John looked back in time to 1963 where he saw and heard Brother Branham revealing the Seven Seals. Taking notes as instructed, and signifying what he saw by Old Testament symbols, he was about to record the full details of the voices of the seven thunders as Brother Branham revealed them, when the Lord commanded "Seal up those things which the seven thunders uttered, and write them not . . . but in the days of the voice of the seventh angel, when he shall begin to sound, the mystery of God should be finished, as He has declared to His servants the prophets." So you see John represents Christ's end time Bride because we are the only ones for whom this mystery is predestinated. Revelation 10:8-11, "After Brother Branham had finished revealing the mystery of the voices of the Seven Thunders, the Voice which . . . [insert your name here if you are in Christ's end-time Bride] . . . heard from heaven commanding John "seal up the voices of the Seven Thunders" addressed me again and said, "Go and take the little Book that is open in the hand of Christ, the Angel of Revelation 10:1-4, who stands in judgment upon Rome, the beast from the sea, and upon the its United States image, the beast from the earth." "So I went to the Angel and said, Give me the little Book. And He said, "Take it, and become one with its Message, which will be difficult to receive, but a blessing to share with others." So I took the little Book out of the Angel's hand, and became one with the revelation of the Seven Thunders; and it was in my mouth sweet as honey, but as soon as I had received it, my belly was bitter for I was accountable and bound to bring my life subject to its revelation. Then He told me, "You must share this Message concerning many peoples and nations and tongues and kings". Revelation 10:8-11 is the ministry of every member of Christ's end-time Bride, for the Life must pass through the Body. Note carefully that the heavenly Voice inspiring the revelation of Jesus Christ to John, that is, to you, Christ's end-time Bride who will not see death, is the Voice of God that revealed the true identity of Jesus Christ to saint Peter (Matthew 16:17). This is your personal confirmation Jesus Christ is the same yesterday, and today and forever, that the faith once delivered unto the saints—the rock of Spiritual revelation from the Father of the Son—has been restored and that the your name is in the Lamb's Book of Life.